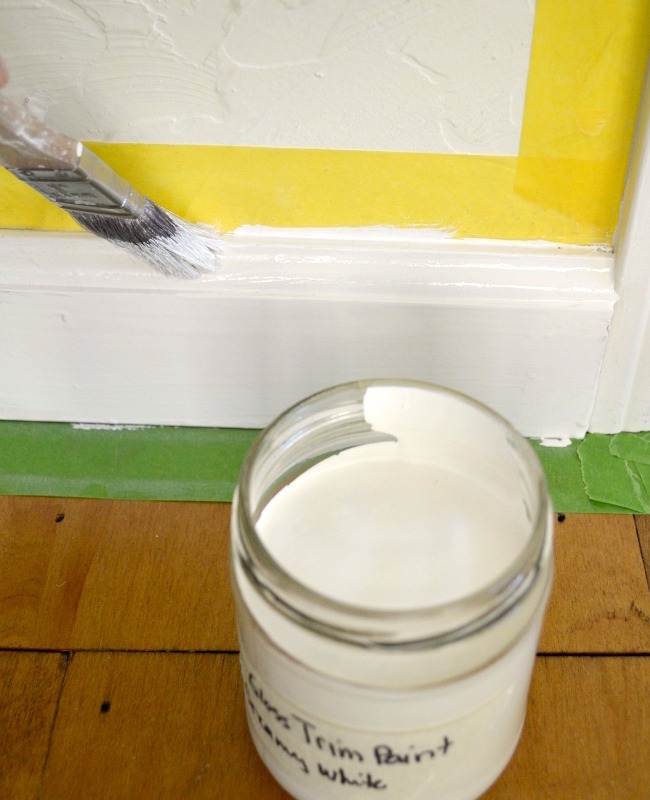 Painting baseboards and trim is one of the best ways to refresh a room and make it sparkle- use these tips to make it quick & easy! I love, love the look of crisp white trim and have invested a good amount of time adding trim (like around a doorway to create more character) and painting baseboards and trim in our ranch-turned-cottage. Have I mentioned it was all brown – a very dark brown? All the trim, all the cabinets, all the wood ceilings, and much of the wood floor. Not exactly the light and bright space I craved in our often gray-and-rainy western Oregon location. 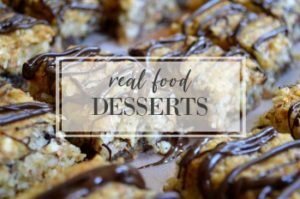 Not terrible, but not so great. Especially because I know how clean and bright it makes everything look (like the whole room!) when freshly painted. In the 12 years we’ve been in this home, I’ve touched up the baseboards and trim at least once, and probably twice in our more trafficked areas. But now that we’re looking to put the house on the market, I wanted to do a quick touch-up by painting the baseboards and any of the trim that needed it since I know how it can make a room sparkle. That’s always a good impression, right? And while I’ve written in the past about painting without taping, I knew in this case the easiest way was going to be using a quality painter’s tape because we don’t have any usable wall paint left for most of the rooms and I needed to make sure there were no mistakes and that the walls and floors stayed clean. Enter FrogTape® brand painter’s tape, which I’ve used in the past and knew would give me those crisp lines that I love, which is pretty impossible without tape. It is the only painting tape treated with patented PaintBlock® Technology which reacts with the water in latex paint and instantly gels to form a barrier against paint bleed giving you the sharpest paint lines possible. I was happy to see that there is a new Delicate Surface tape in addition to the Multi-Surface Tape, which has a low adhesion (which you can leave most surfaces for up to 60 days! ), making it perfect for our painted walls. When you don’t have access to the original paint, you want to make sure nothing gets pulled off! A small, narrow, angled brush – I like 1″ best, but 1-1/2″ works, too (the key is the angled brush- it makes painting trim a whole lot easier). 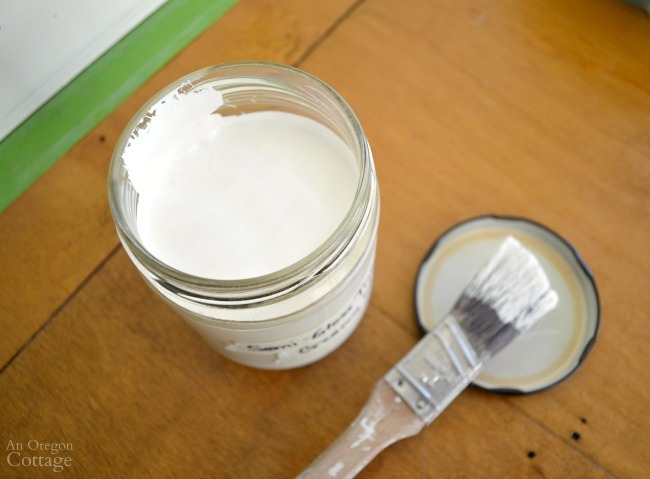 Trim paint – I recommend a semi-gloss for trim (or even high gloss if you’d like). A small rag for any drips that may happen. 1. 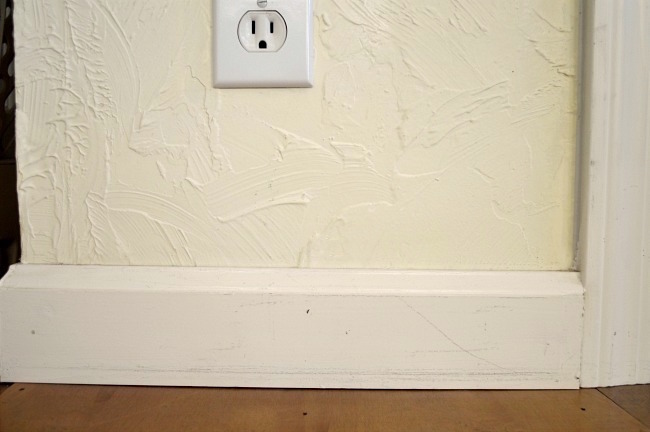 Clean your baseboards and trim. If yours are anything like mine, you’ll need more than a dusting, so use a slightly wet rag or a foam eraser to get them really clean. Your paint will thank you. 2. Apply tape to wall. Use FrogTape® Delicate Surface tape for the wall and seal the edges where the paint will touch with a fingernail or credit card. You can see that our walls have a slight texture, but this tape worked perfectly after I sealed the edge. 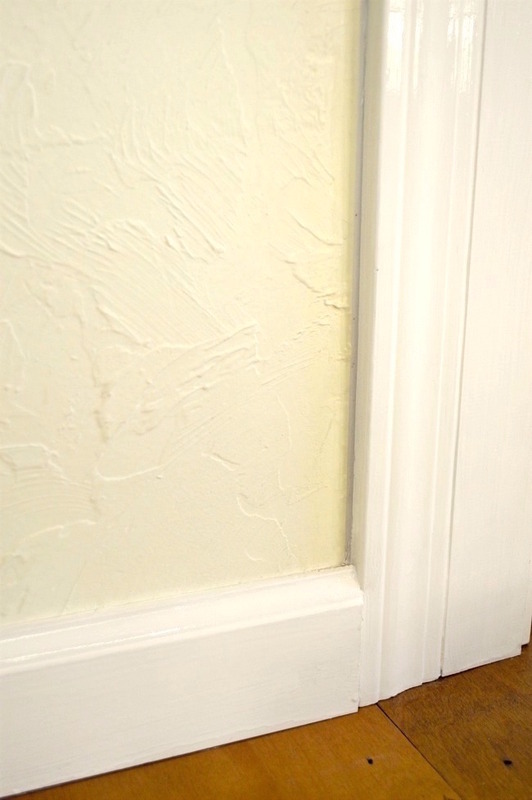 If your walls are more heavily textured, there is a tape product made specifically for textured walls, too, which you can find on FrogTape.com. 3. Apply tape to floor. You can use just one kind of tape for both walls and floor (I would choose the Delicate, though, to protect the walls), but since I had the Multi-Surface tape I used that for the floor. Again make sure to seal the edge that you will paint against. 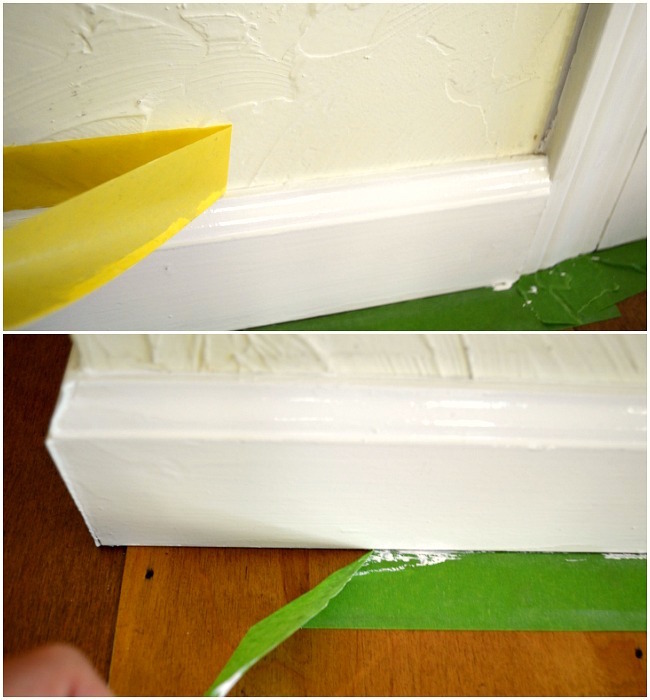 Tip: to apply tape around trim pieces that aren’t straight, simply tear small pieces and fit around trim (last photo above) – it’s a quick tip that’s especially good for touch-up painting, since you don’t need to paint all the way to the floor, just protect the floor. Tip: to make trim and touch-up painting as easy as possible, keep your trim paint in a small, labeled jar that’s easy to grab when you need. When using the paint in the jar, make sure to press your brush on the top sides, not on the very top of the jar (you can see above where I wiped my brush), and you will always keep your lid clean for easy-on, easy-off. Bonus: the lid is a great place to rest your brush when painting too! 4. Paint baseboards and trim. Use one coat for touch-ups and two if painting a new color. Use the angle part of the brush for the sides and tops of the trim, and the flat part for the rest. 5. 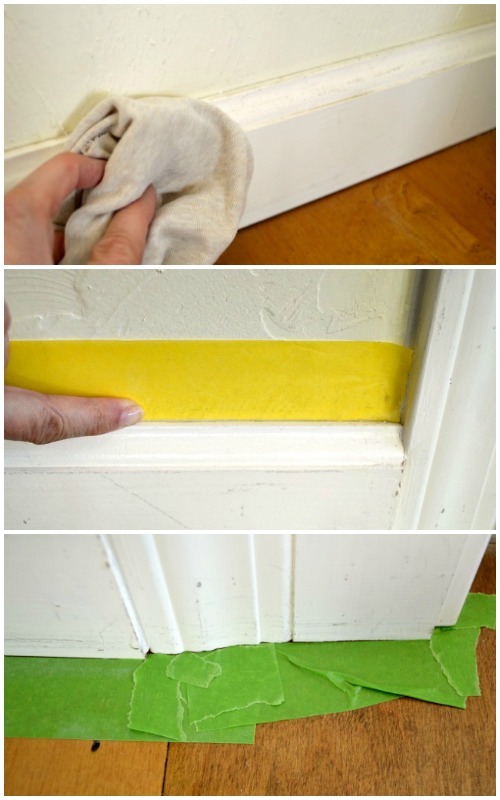 Remove tape while it’s still wet. Pull at an angle for the best results and if you’re anything like me you will get a thrill at seeing those clean surfaces and crisp edges! Tip: roll the tape with wet paint inside as much as possible and keep a piece of newspaper nearby to roll the tape onto (and use the rag for any that gets on your hands). When you’ve filled the paper, simply roll it up with the wet tape inside and throw away. It minimizes the mess and there’s no wet paint in your trash can. 6. Enjoy your sparkling trim and refreshed room! I’m happy to report that all of the wall paint stayed put and the trim looks so clean and fresh, it makes me remember why I love white trim so much. 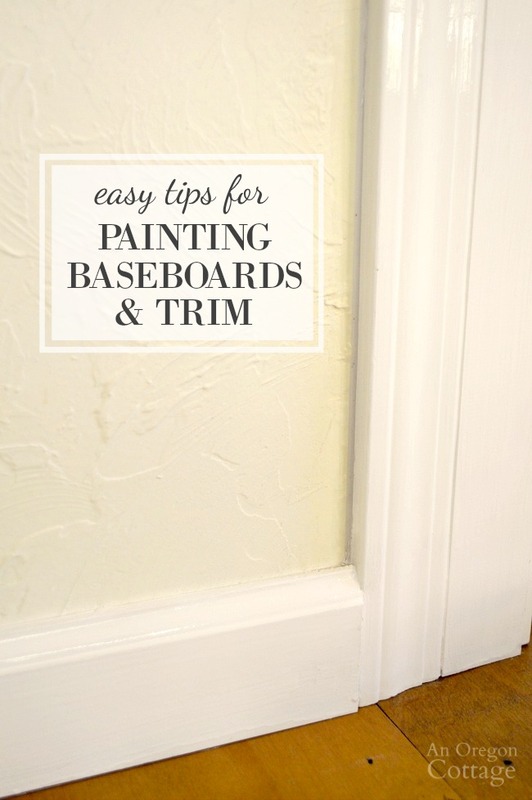 I plan on painting baseboards and trim in more key places for the house to show the best when we put it on the market, and I’m glad I found this no-worry way to get it done quickly. 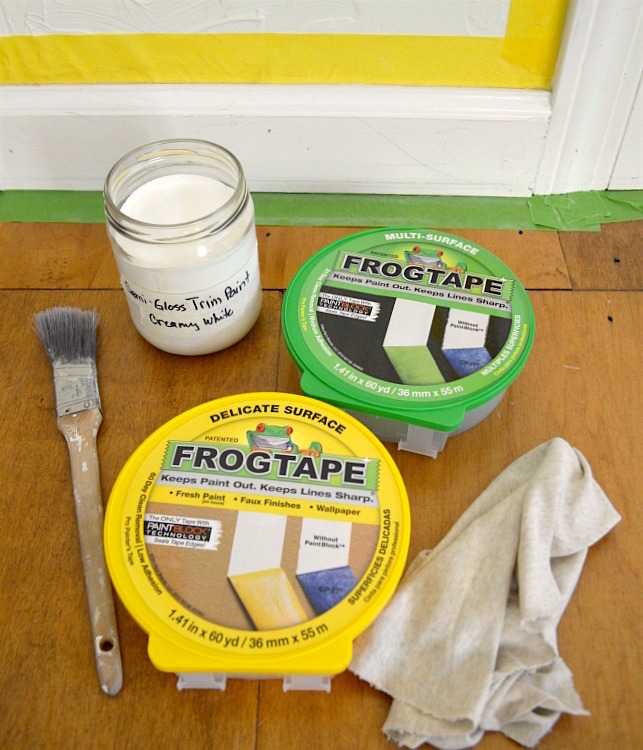 Be sure to visit FrogTape® painting inspiration on Pinterest for more tips and ideas. Your article was very encouraging as I am painting my entire home. The white trim has been driving me crazy and my mother lives with me and uses a walker. I am convinced that a walker beats up a baseboard more than anything in the world. My question is, is it better to paint the walls or the baseboard first I have done some rooms already where I’ve just gotten the walls painted but still have baseboard to do but still have a lot to paint and would like your recommendation. Jami- we have had additional electrical installed for the jacuzzi, the entry of the house for charging phones and such, fans in all the rooms including bedrooms, and TVs in the office and living room-a light over the dining room area instead of ugly pot lights- new bamboo flooring because with dogs, I will never have carpeting again!! We had cement poured for sidewalks and a pad for our travel trailer (and the jacuzzi), new fencing around the house to keep the deer and bears out of the garden- new blinds to keep the amazing heat at bay, cabinets and counters installed for the office, new raised bed planters, (we did that) a whole new drip system for ‘part’ of the garden (we did that too) and lots of landscaping plants! We also put in cabinets in the garage (we did that), a recycle center in the garage,(we did that too) found a place to hang the kayaks and still have to work on shelves and a workbench in the garage. We also need a shed (someday) and a potting area ha ha! We still have a LONG way to go- a new house is good for many things, but mostly, projects that you have to do! Especially if you have rocks and dirt as your landscaping! 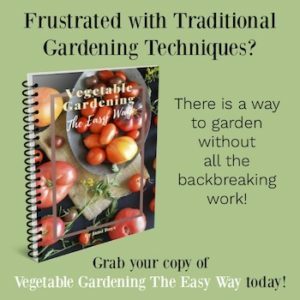 We love to garden and are working on it this year to see what works and what doesn’t here in Northern Nevada! Similar climate to where we lived in Klamath Falls OR before- but much more wind! It’s a lot of work, but, we love it! Anyone who has bought a new build will tell you it takes years to get your yard and house and garden in order 🙂 And…it takes a lot of time and budgeting! I really need to do this at our house! Even though we just bought the house brand spankin’ new last September, we had all the carpeting ripped out and bamboo floors installed…so the trim was removed and then replaced. The installation company didn’t use Dap to make the edges look nice, and of course, now the cut lines show where it was originally neatly painted to hide the cuts. Bleah. I hate messy trim, but we’ve had so many other projects to get done that now they need to be cleaned, repainted and Dapped 🙂 Thanks for the timely reminder! 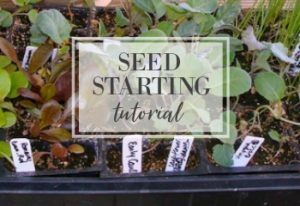 I can do this indoor project on those 100+ degree days with the air conditioning on!